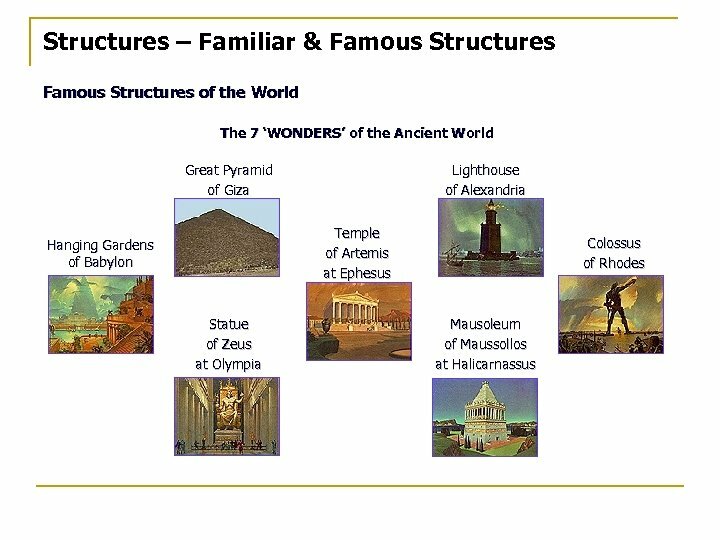 Structures - Types Frame Structures Have a skeleton of strong materials, which is then filled and covered with other materials, supporting the overall structure. Most of the inside part of the structure is empty space. - Load-Bearing Walls: these are the walls that support the load of the building. Walls - Partition Walls: these are the walls that divide up the space inside the building. Walls - because they are relatively easy to design and build, and inexpensive to manufacture, the frame structure is the most common construction choice. A Bicycle frame supports the load it carries on the seat. Identify: Rigid Joint Brace Rigid Shape Mobile Joint Type of Material Support All frames, whether simple or complex must overcome similar problems. To solve these problems joints, type of material, bracing, anchoring and design all must be considered in the overall structural frame construction. 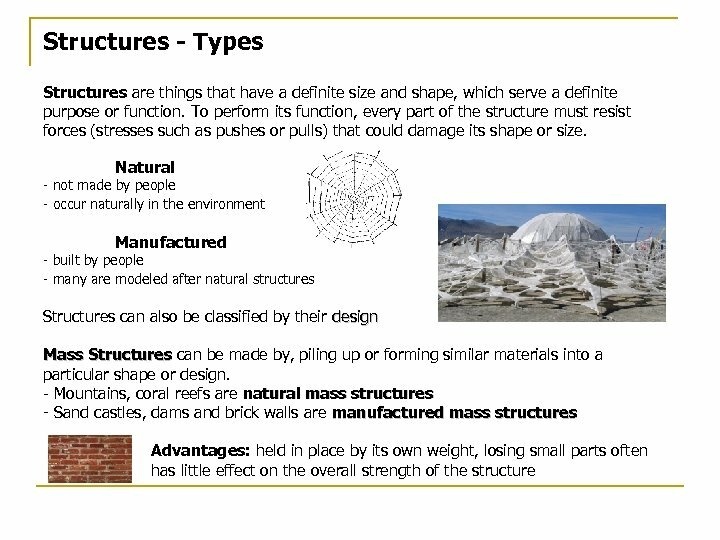 Structures - Types Shell Structures, which keep their shape and support loads, even without a frame, or solid mass material inside, are called shell structures. These structures use a thin, carefully shaped, outer layer of material, to provide their strength and rigidity. The shape of a shell structure spreads forces throughout the whole structure, which means every part of the structure supports only a small part of the load, giving it its strength. Examples include: igloos, egg cartons, turtle shell, food or pop cans, or, even bubbles in foam and cream puffs. 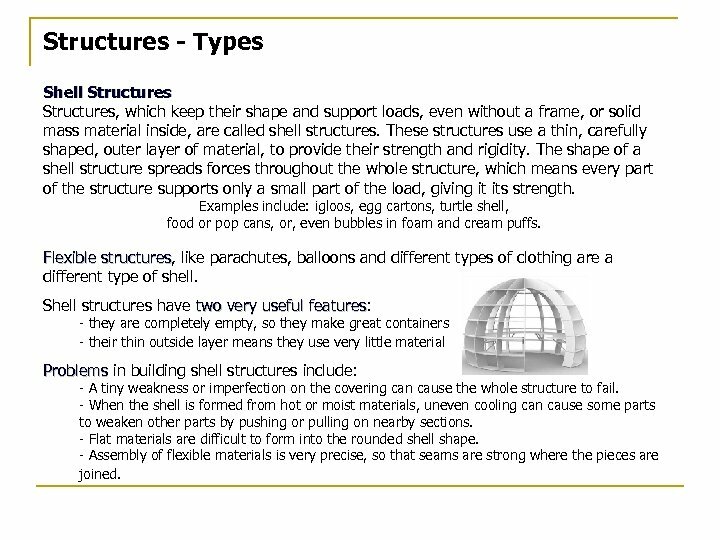 Flexible structures, like parachutes, balloons and different types of clothing are a structures different type of shell. Shell structures have two very useful features: features - they are completely empty, so they make great containers - their thin outside layer means they use very little material Problems in building shell structures include: - A tiny weakness or imperfection on the covering can cause the whole structure to fail. - When the shell is formed from hot or moist materials, uneven cooling can cause some parts to weaken other parts by pushing or pulling on nearby sections. - Flat materials are difficult to form into the rounded shell shape. - Assembly of flexible materials is very precise, so that seams are strong where the pieces are joined. 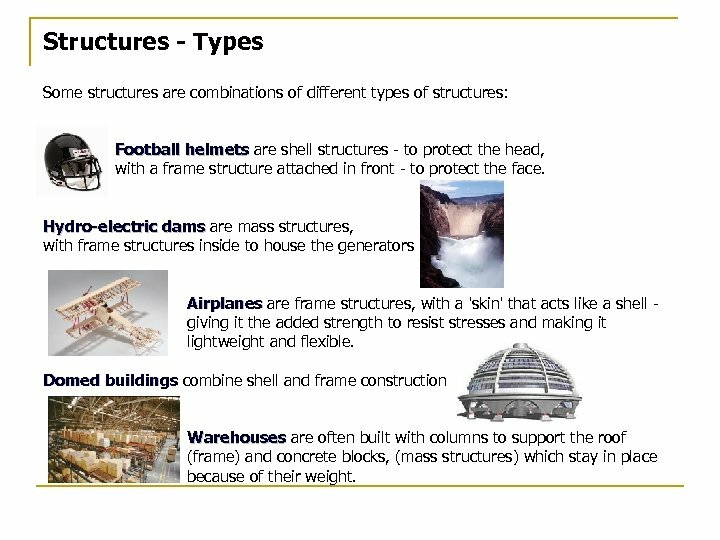 Structures - Types Some structures are combinations of different types of structures: Football helmets are shell structures - to protect the head, with a frame structure attached in front - to protect the face. Hydro-electric dams are mass structures, with frame structures inside to house the generators Airplanes are frame structures, with a 'skin' that acts like a shell giving it the added strength to resist stresses and making it lightweight and flexible. Domed buildings combine shell and frame construction Warehouses are often built with columns to support the roof (frame) and concrete blocks, (mass structures) which stay in place because of their weight. 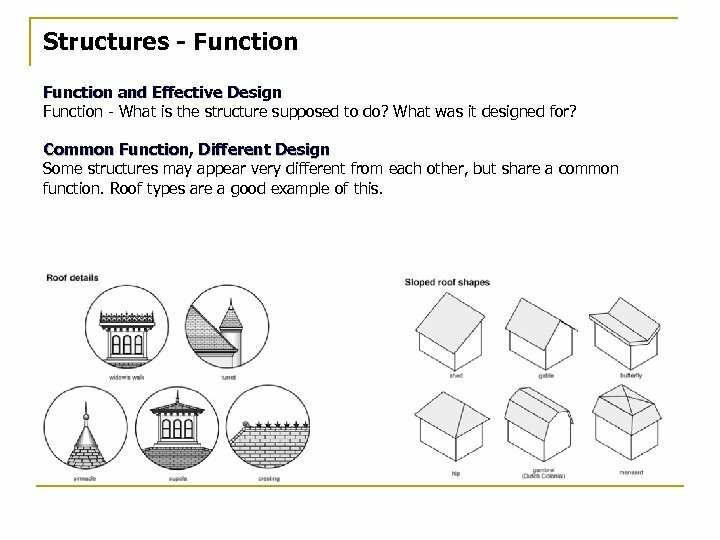 Structures - Function and Effective Design Function - What is the structure supposed to do? What was it designed for? Common Function, Different Design Some structures may appear very different from each other, but share a common function. Roof types are a good example of this. 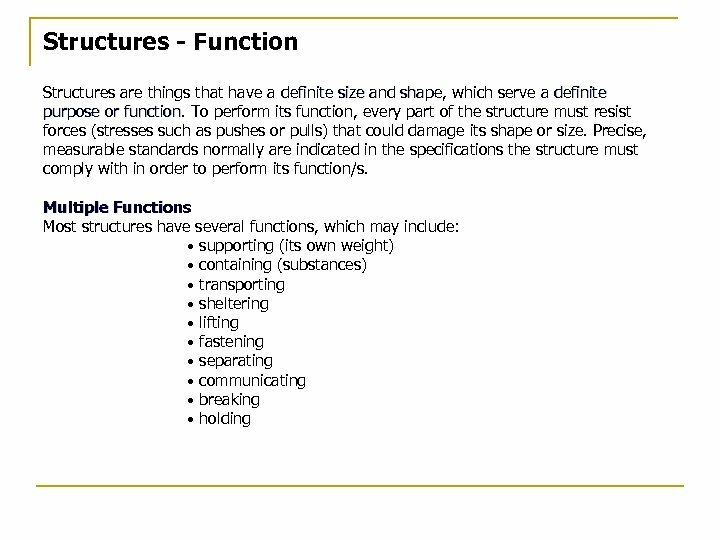 Structures - Function Other Characteristics of Structures Besides form and function, structures can be interpreted and classified by the materials and components they are made of. 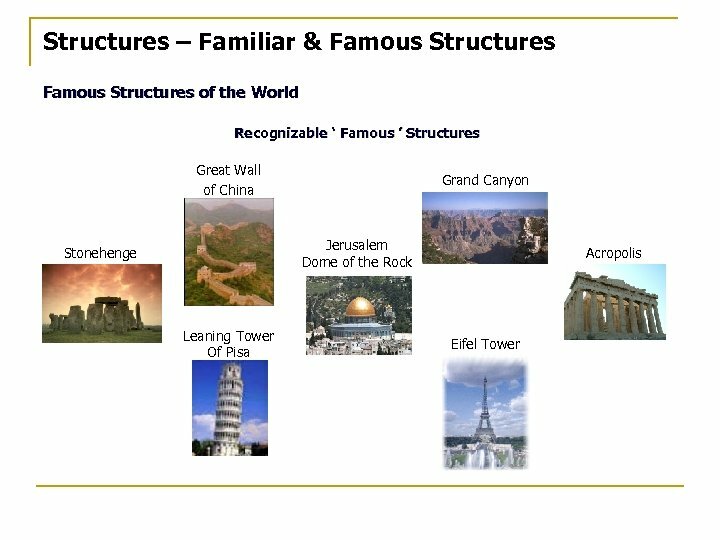 Natural and man-made structures share some common features. 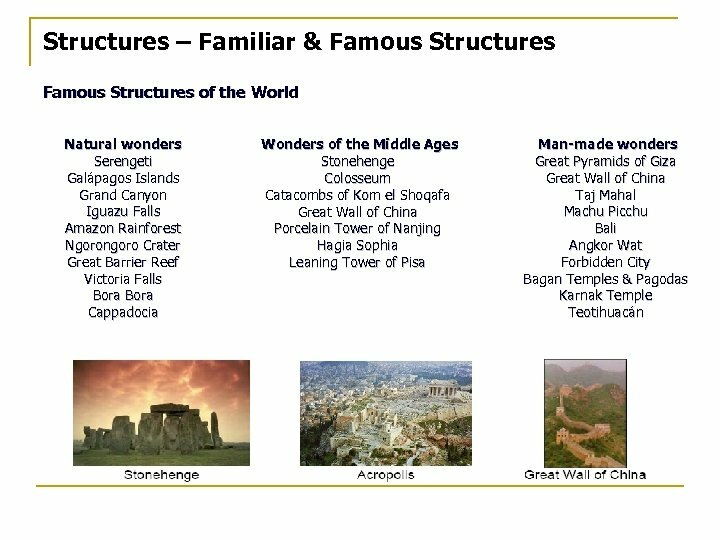 Safety - all structures are designed and built within an acceptable margin of safety (but usually, structures are designed with a built-in large margin of safety). Cost - adding extra strength to a structure costs money, as well as using more highly skilled workers and better materials does. Norman Breakey designed the paint roller to make painting a large wall less time consuming and more economical. Designers plan their structures to withstand conditions they hypothesize will occur. Good design is a compromise between a reasonable margin of safety and reasonable cost. 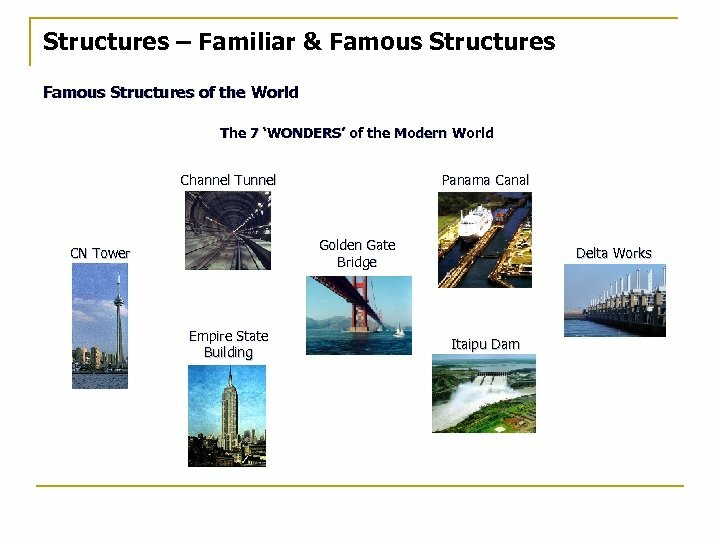 Usually, totally unexpected events will cause even the best (well-designed) structures to fail (example: the World Trade Centre Towers). Towers Aesthetics is the study of beauty in nature. The best designs usually 'look good' - 'aesthetically pleasing' · The aesthetics are usually accomplished by the shape, texture, color, type of material, symmetry and simplicity of the repeated pattern used in the design. 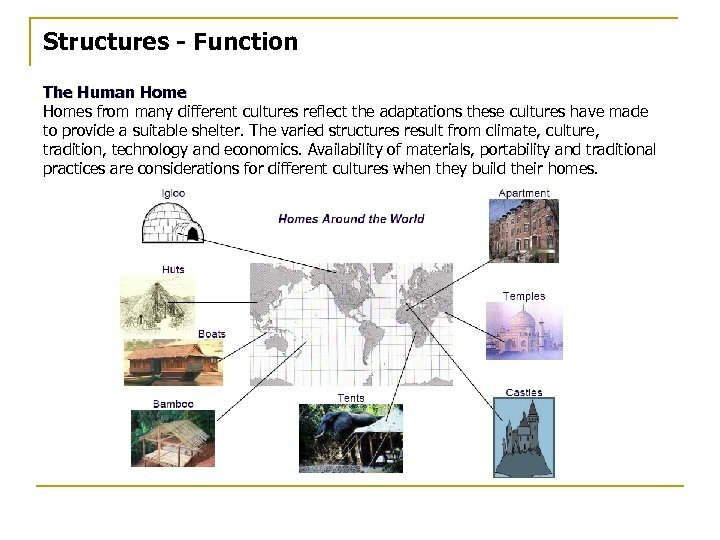 Structures - Function The Human Homes from many different cultures reflect the adaptations these cultures have made to provide a suitable shelter. 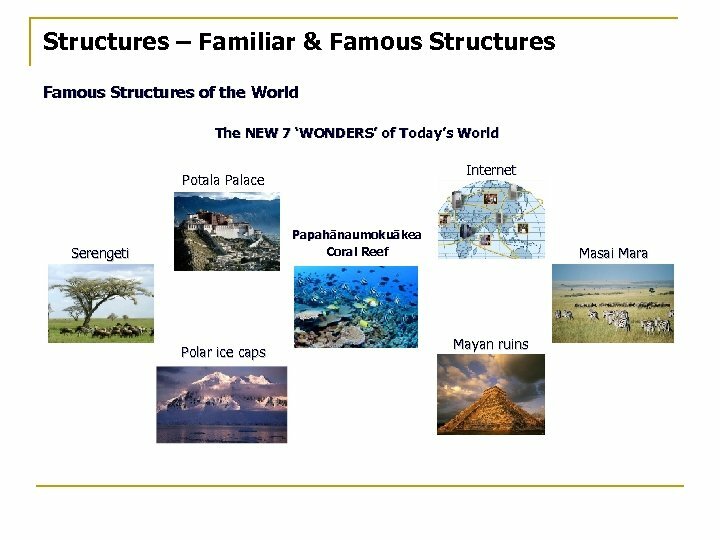 The varied structures result from climate, culture, tradition, technology and economics. Availability of materials, portability and traditional practices are considerations for different cultures when they build their homes. 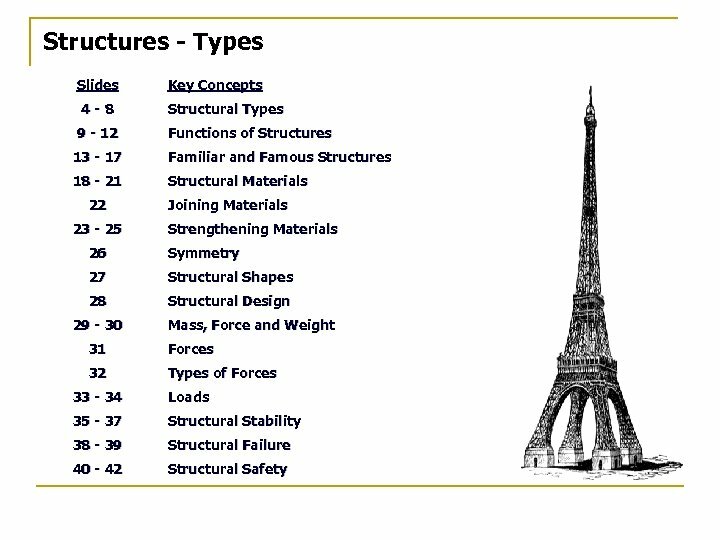 Structures – Structural Materials – the properties or characteristics of different materials must match the purpose of the structure. Composite Materials There are different kinds of strength – tension (pulling) …. steel rods – compression (pushing) …. concrete To enable the structure to withstand both types of forces acting on it, a composite material is used – reinforced concrete (concrete poured over steel rebar (rods). Layered Materials Layers of different materials (Tetra Pak) are pressed and glued together, combining the properties of the different materials. The layers are often called laminations Woven or Knit Materials Spinning or twisting, looping or knotting fibres together, gives material added strength. A loom is used to weave two or more pieces of yarn together in a crisscross pattern to make cloth. Pressing, gluing, melting and dissolving are also ways to combine materials to gain strength. 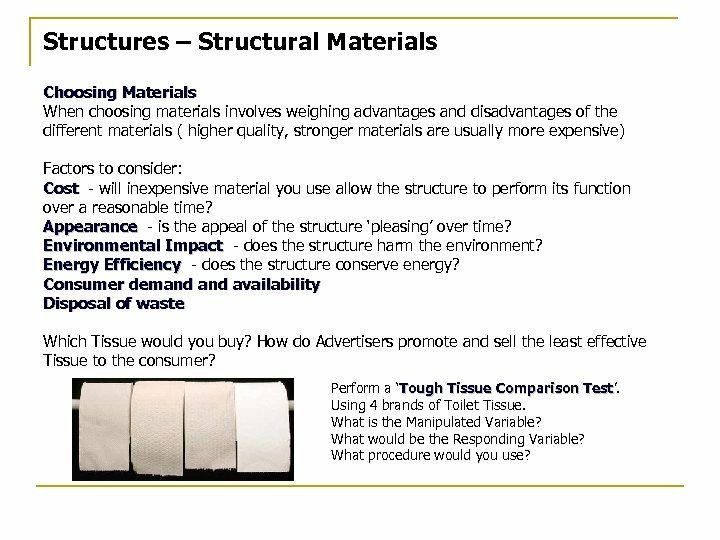 Structures – Structural Materials Choosing Materials When choosing materials involves weighing advantages and disadvantages of the different materials ( higher quality, stronger materials are usually more expensive) Factors to consider: Cost - will inexpensive material you use allow the structure to perform its function over a reasonable time? Appearance - is the appeal of the structure ‘pleasing’ over time? Environmental Impact - does the structure harm the environment? Energy Efficiency - does the structure conserve energy? Consumer demand availability Disposal of waste Which Tissue would you buy? How do Advertisers promote and sell the least effective Tissue to the consumer? Perform a ‘Tough Tissue Comparison Test’. Test Using 4 brands of Toilet Tissue. What is the Manipulated Variable? What would be the Responding Variable? What procedure would you use? 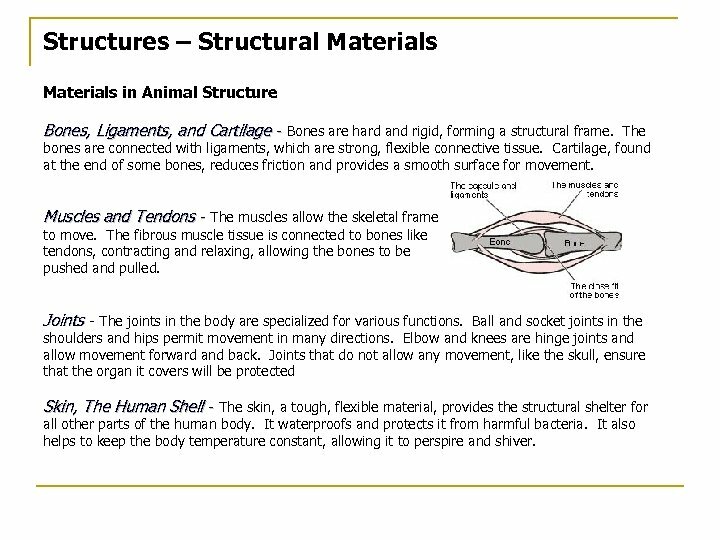 Structures – Structural Materials in Animal Structure Bones, Ligaments, and Cartilage - Bones are hard and rigid, forming a structural frame. The bones are connected with ligaments, which are strong, flexible connective tissue. Cartilage, found at the end of some bones, reduces friction and provides a smooth surface for movement. Muscles and Tendons - The muscles allow the skeletal frame to move. The fibrous muscle tissue is connected to bones like tendons, contracting and relaxing, allowing the bones to be pushed and pulled. Joints - The joints in the body are specialized for various functions. Ball and socket joints in the shoulders and hips permit movement in many directions. Elbow and knees are hinge joints and allow movement forward and back. Joints that do not allow any movement, like the skull, ensure that the organ it covers will be protected Skin, The Human Shell - The skin, a tough, flexible material, provides the structural shelter for all other parts of the human body. It waterproofs and protects it from harmful bacteria. It also helps to keep the body temperature constant, allowing it to perspire and shiver. 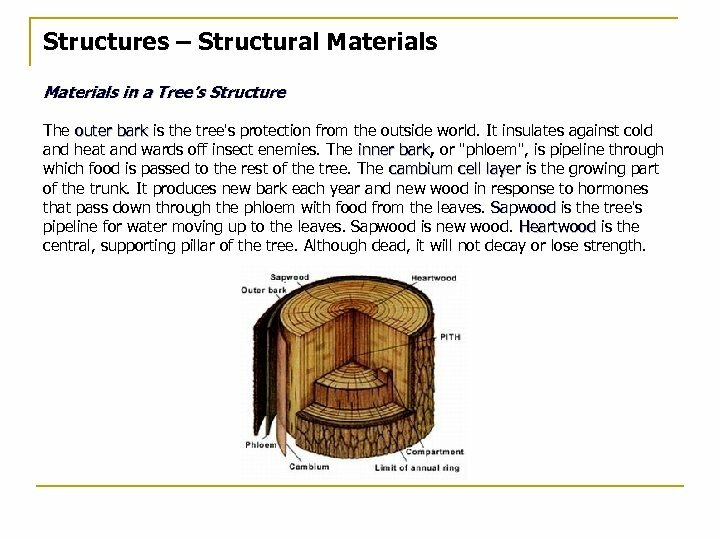 Structures – Structural Materials in a Tree’s Structure The outer bark is the tree's protection from the outside world. It insulates against cold and heat and wards off insect enemies. The inner bark, or "phloem", is pipeline through bark which food is passed to the rest of the tree. The cambium cell layer is the growing part of the trunk. It produces new bark each year and new wood in response to hormones that pass down through the phloem with food from the leaves. Sapwood is the tree's pipeline for water moving up to the leaves. Sapwood is new wood. Heartwood is the central, supporting pillar of the tree. Although dead, it will not decay or lose strength. 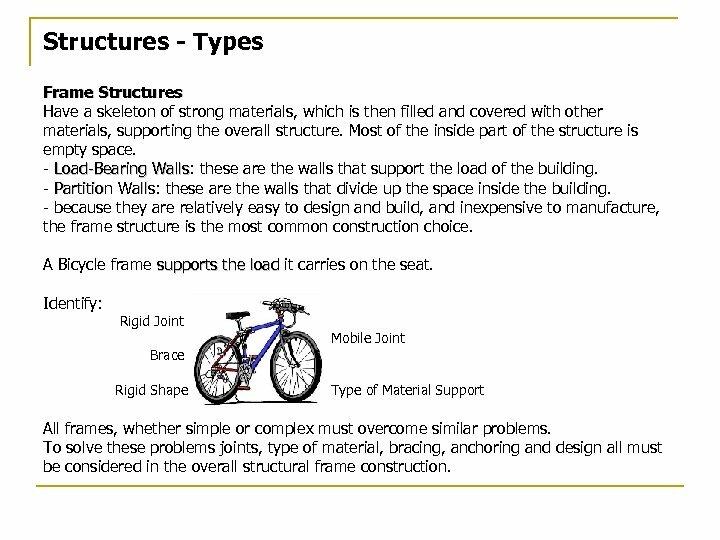 Structures – Joining Materials The place at which structural components in a structure are joined together is called a joint. 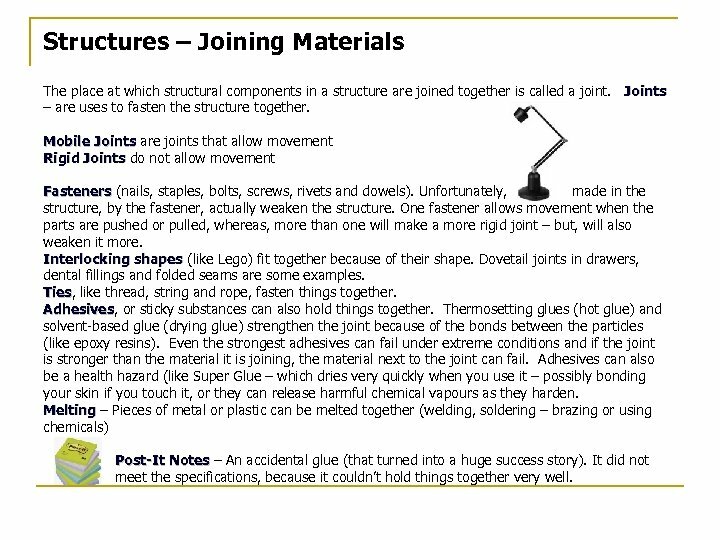 Joints – are uses to fasten the structure together. Mobile Joints are joints that allow movement Rigid Joints do not allow movement Fasteners (nails, staples, bolts, screws, rivets and dowels). Unfortunately, the holes made in the structure, by the fastener, actually weaken the structure. One fastener allows movement when the parts are pushed or pulled, whereas, more than one will make a more rigid joint – but, will also weaken it more. Interlocking shapes (like Lego) fit together because of their shape. Dovetail joints in drawers, dental fillings and folded seams are some examples. Ties, like thread, string and rope, fasten things together. Ties Adhesives, or sticky substances can also hold things together. Thermosetting glues (hot glue) and Adhesives solvent-based glue (drying glue) strengthen the joint because of the bonds between the particles (like epoxy resins). Even the strongest adhesives can fail under extreme conditions and if the joint is stronger than the material it is joining, the material next to the joint can fail. Adhesives can also be a health hazard (like Super Glue – which dries very quickly when you use it – possibly bonding your skin if you touch it, or they can release harmful chemical vapours as they harden. Melting – Pieces of metal or plastic can be melted together (welding, soldering – brazing or using chemicals) Post-It Notes – An accidental glue (that turned into a huge success story). It did not meet the specifications, because it couldn’t hold things together very well. 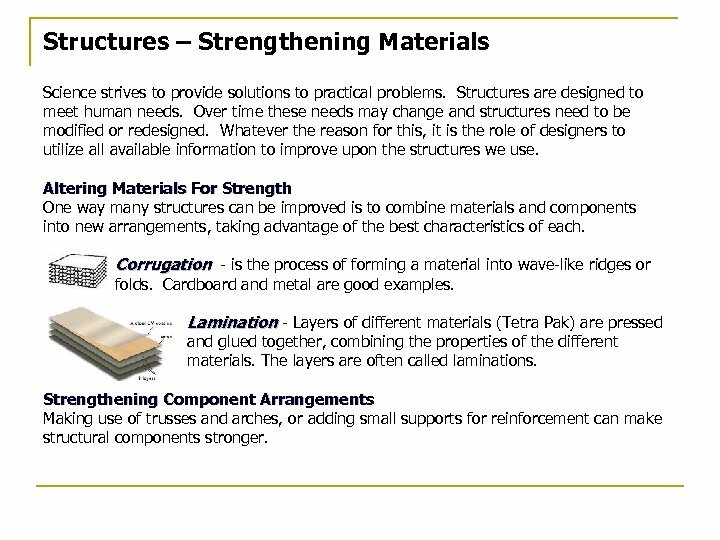 Structures – Strengthening Materials Science strives to provide solutions to practical problems. Structures are designed to meet human needs. Over time these needs may change and structures need to be modified or redesigned. Whatever the reason for this, it is the role of designers to utilize all available information to improve upon the structures we use. 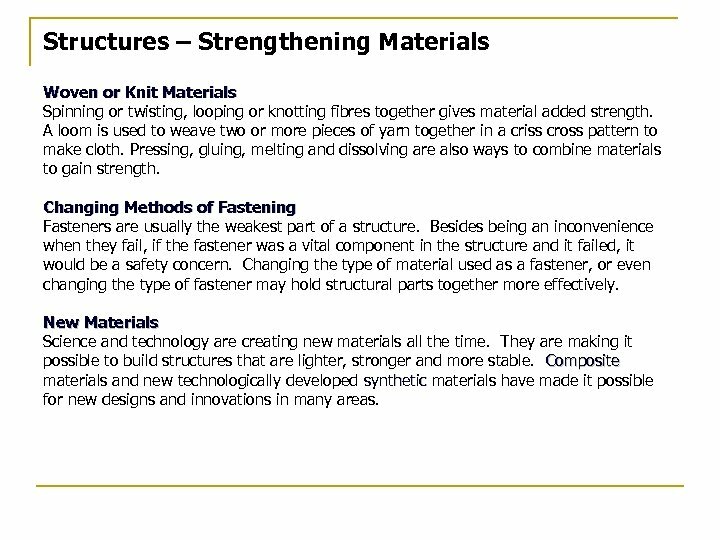 Altering Materials For Strength One way many structures can be improved is to combine materials and components into new arrangements, taking advantage of the best characteristics of each. Corrugation - is the process of forming a material into wave-like ridges or folds. Cardboard and metal are good examples. Lamination - Layers of different materials (Tetra Pak) are pressed and glued together, combining the properties of the different materials. The layers are often called laminations. Strengthening Component Arrangements Making use of trusses and arches, or adding small supports for reinforcement can make structural components stronger. 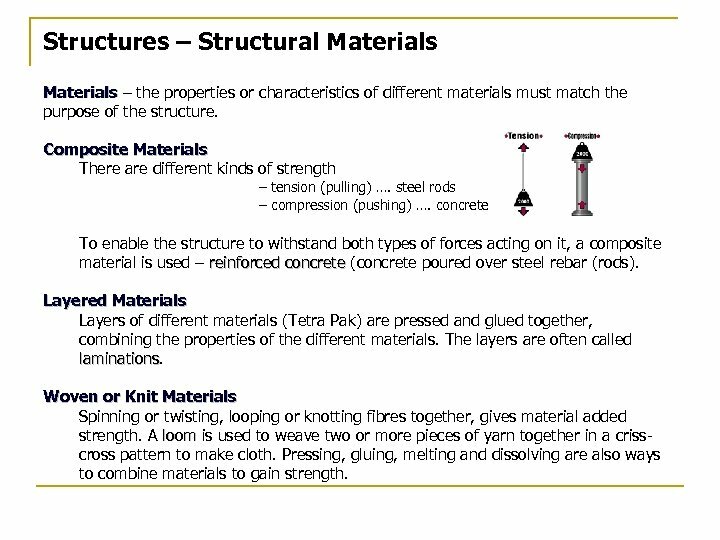 Structures – Strengthening Materials Woven or Knit Materials Spinning or twisting, looping or knotting fibres together gives material added strength. A loom is used to weave two or more pieces of yarn together in a criss cross pattern to make cloth. Pressing, gluing, melting and dissolving are also ways to combine materials to gain strength. Changing Methods of Fastening Fasteners are usually the weakest part of a structure. Besides being an inconvenience when they fail, if the fastener was a vital component in the structure and it failed, it would be a safety concern. Changing the type of material used as a fastener, or even changing the type of fastener may hold structural parts together more effectively. New Materials Science and technology are creating new materials all the time. They are making it possible to build structures that are lighter, stronger and more stable. Composite materials and new technologically developed synthetic materials have made it possible for new designs and innovations in many areas. 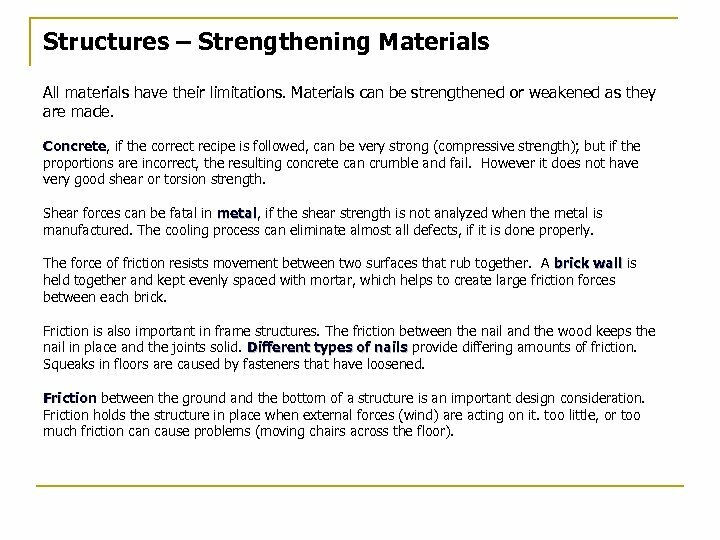 Structures – Strengthening Materials All materials have their limitations. Materials can be strengthened or weakened as they are made. Concrete, if the correct recipe is followed, can be very strong (compressive strength); but if the Concrete proportions are incorrect, the resulting concrete can crumble and fail. However it does not have very good shear or torsion strength. Shear forces can be fatal in metal, if the shear strength is not analyzed when the metal is metal manufactured. The cooling process can eliminate almost all defects, if it is done properly. The force of friction resists movement between two surfaces that rub together. A brick wall is held together and kept evenly spaced with mortar, which helps to create large friction forces between each brick. Friction is also important in frame structures. The friction between the nail and the wood keeps the nail in place and the joints solid. Different types of nails provide differing amounts of friction. Squeaks in floors are caused by fasteners that have loosened. Friction between the ground and the bottom of a structure is an important design consideration. Friction holds the structure in place when external forces (wind) are acting on it. too little, or too much friction cause problems (moving chairs across the floor). 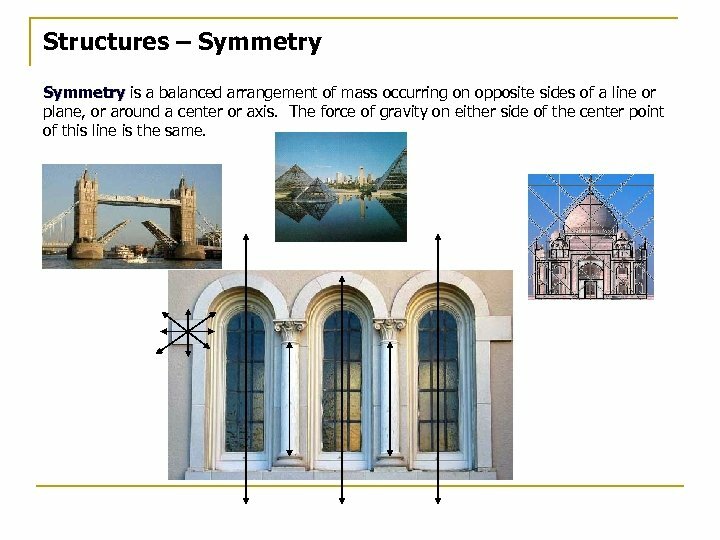 Structures – Symmetry is a balanced arrangement of mass occurring on opposite sides of a line or plane, or around a center or axis. The force of gravity on either side of the center point of this line is the same. 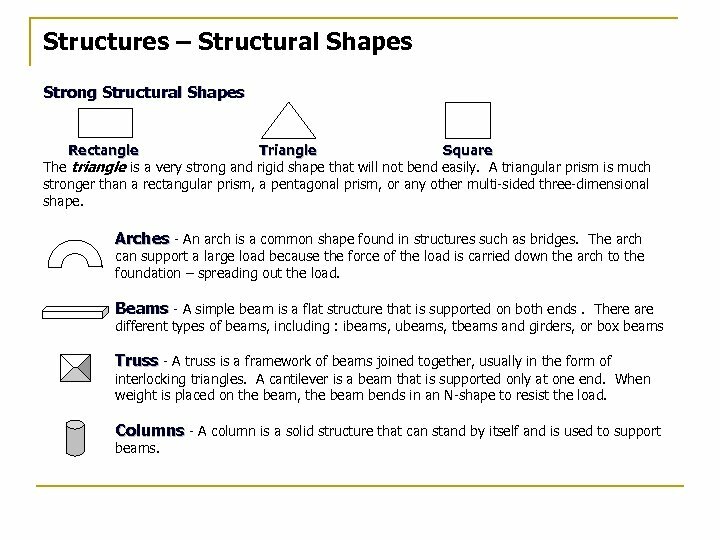 Structures – Structural Shapes Strong Structural Shapes Rectangle Triangle Square The triangle is a very strong and rigid shape that will not bend easily. A triangular prism is much stronger than a rectangular prism, a pentagonal prism, or any other multi-sided three-dimensional shape. Arches - An arch is a common shape found in structures such as bridges. The arch can support a large load because the force of the load is carried down the arch to the foundation – spreading out the load. Beams - A simple beam is a flat structure that is supported on both ends. There are different types of beams, including : ibeams, ubeams, tbeams and girders, or box beams Truss - A truss is a framework of beams joined together, usually in the form of interlocking triangles. A cantilever is a beam that is supported only at one end. When weight is placed on the beam, the beam bends in an N-shape to resist the load. Columns - A column is a solid structure that can stand by itself and is used to support beams. 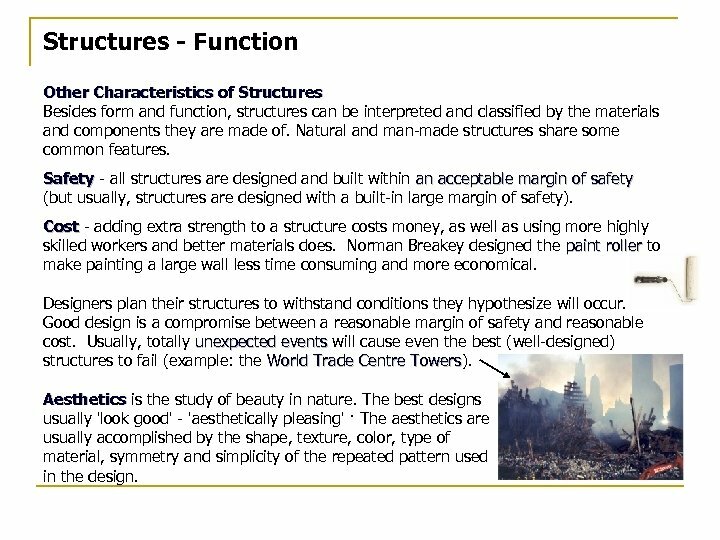 Structures – Structural Design When evaluating whether a structure is doing what it was designed to do, and doing it as well as it can, there are certain factors to consider: Cost Benefits Safety Impact on the Environment - how much will it cost to build, operate and maintain the structure - can we afford to build it? - is the appeal of the structure 'pleasing' over time? - who will enjoy the benefits of this structure? - is there a safety hazard? - who and what could be affected by these risks? - does the structure harm the environment? - does the structure conserve energy? Improving Designs Case Studies The first Mountain Bike, ‘The Sherpa ’, was produced in 1982. Investigate the design timeline for this device, and then preview the design changes that occurred with the ‘non-removable soda can opener ’ (you will learn about them in the Mechanical Systems Unit in Grade 8). 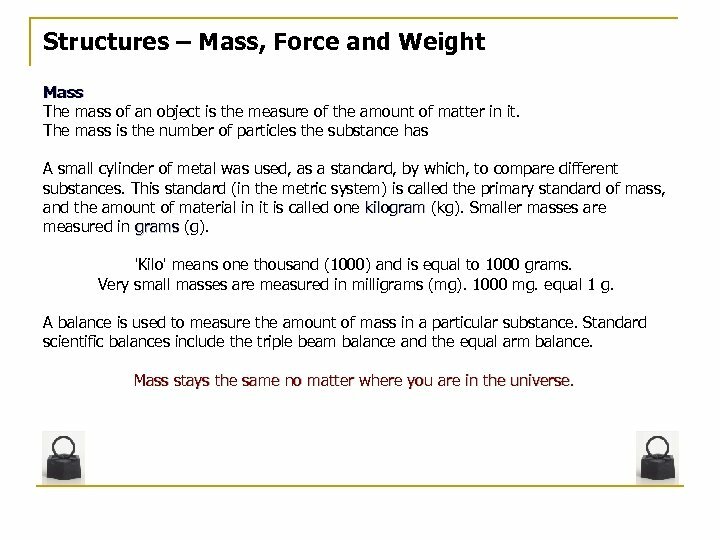 Structures – Mass, Force and Weight Mass The mass of an object is the measure of the amount of matter in it. The mass is the number of particles the substance has A small cylinder of metal was used, as a standard, by which, to compare different substances. This standard (in the metric system) is called the primary standard of mass, and the amount of material in it is called one kilogram (kg). Smaller masses are measured in grams (g). 'Kilo' means one thousand (1000) and is equal to 1000 grams. Very small masses are measured in milligrams (mg). 1000 mg. equal 1 g. A balance is used to measure the amount of mass in a particular substance. Standard scientific balances include the triple beam balance and the equal arm balance. Mass stays the same no matter where you are in the universe. 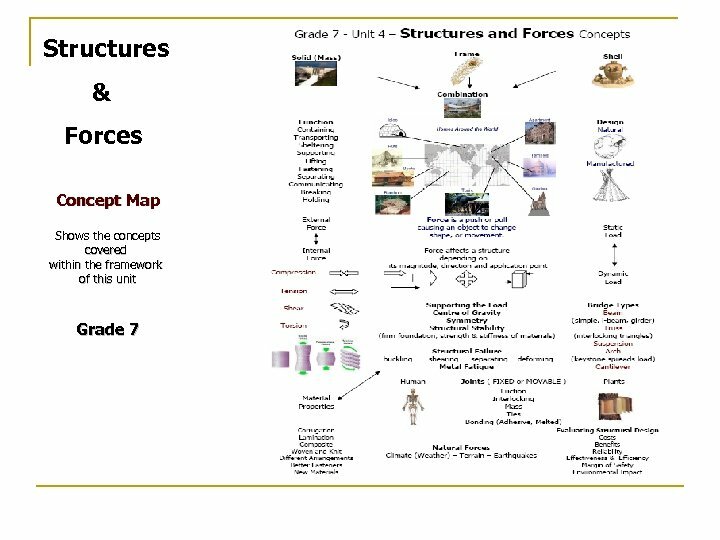 Structures – Forces A force is a push or pull that tends to cause an object to change its movement or shape. 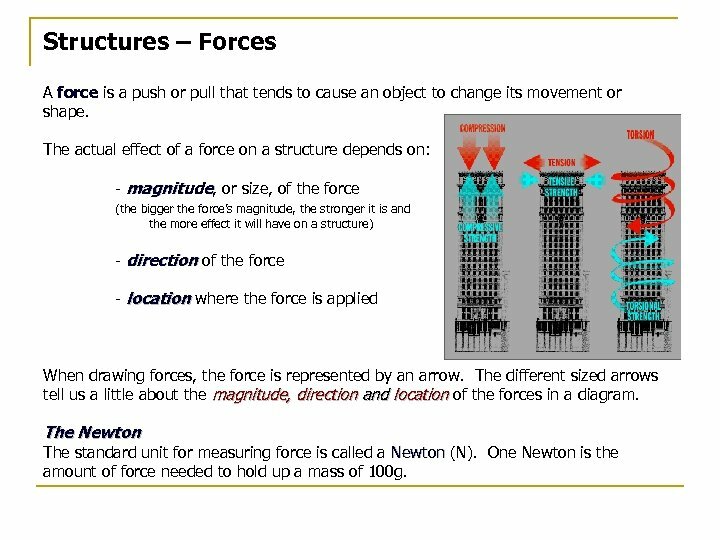 The actual effect of a force on a structure depends on: - magnitude, or size, of the force (the bigger the force’s magnitude, the stronger it is and the more effect it will have on a structure) - direction of the force - location where the force is applied When drawing forces, the force is represented by an arrow. The different sized arrows tell us a little about the magnitude, direction and location of the forces in a diagram. The Newton The standard unit for measuring force is called a Newton (N). 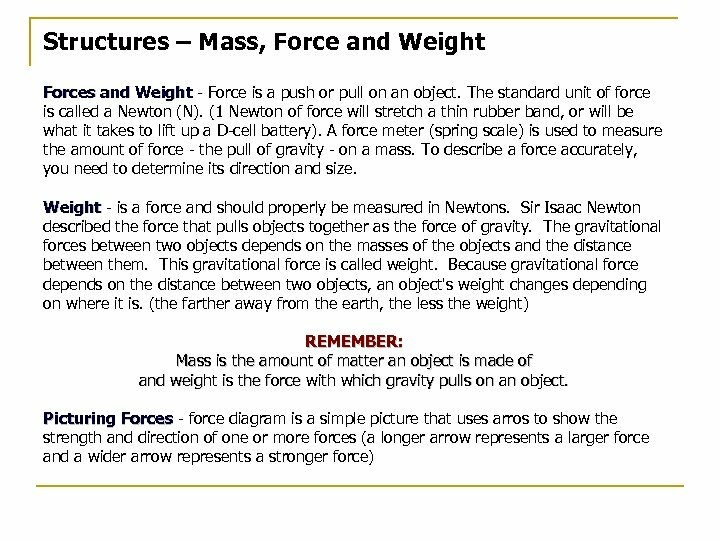 One Newton is the amount of force needed to hold up a mass of 100 g.
Structures – Types of Forces The five basic types of force action are illustrated here: Compression - Compression forces crush a material by squeezing it together. Compressive strength measures the largest compression force the material can withstand before it loses its shape or fails. Causing, for example, buckling of a bridge pier. Tension - Tension forces stretch a material by pulling its ends apart. Tensile strength measures the largest tension force the material can withstand before failing. Causing, for example, extension of a suspension bridge chain or hanger Shearing or racking of - Shear forces bend or tear a material by pressing different parts in opposite directions at the same time. Shear strength measures the largest shear force the material can withstand before it rips apart. For example, a bridge beam. Torsion - Torsion forces twist a material by turning the ends in opposite directions. Torsion strength measures the largest torsion force the material can withstand still spring back into its original shape. Causing, for example, the twisting of a bridge deck. Bending - is a combination of tension and compression. 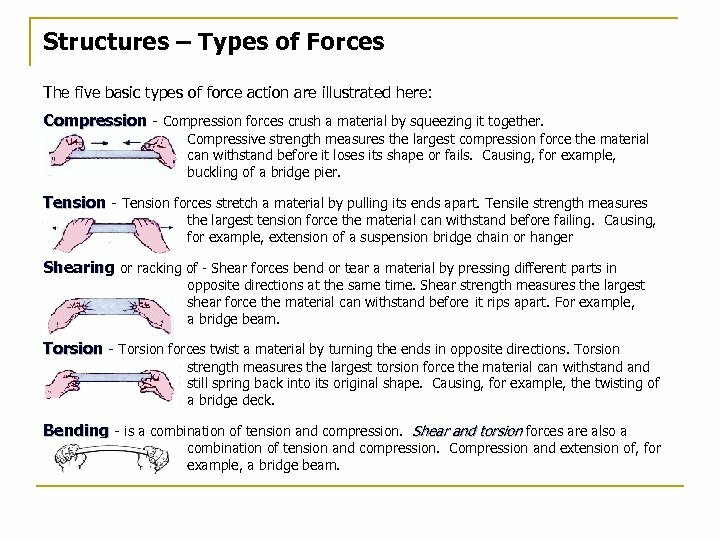 Shear and torsion forces are also a combination of tension and compression. Compression and extension of, for example, a bridge beam. 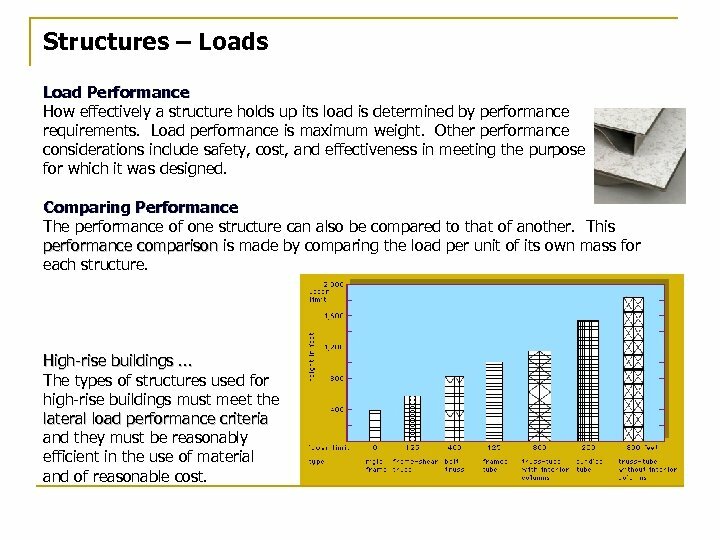 Structures – Loads Load Performance How effectively a structure holds up its load is determined by performance requirements. Load performance is maximum weight. Other performance considerations include safety, cost, and effectiveness in meeting the purpose for which it was designed. Comparing Performance The performance of one structure can also be compared to that of another. This performance comparison is made by comparing the load per unit of its own mass for each structure. High-rise buildings. . . The types of structures used for high-rise buildings must meet the lateral load performance criteria and they must be reasonably efficient in the use of material and of reasonable cost. 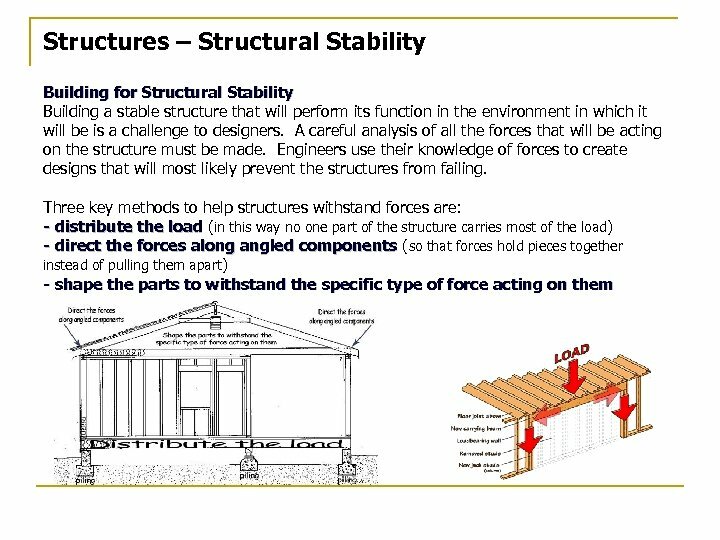 Structures – Structural Stability External forces on structures are stresses that act on a structure from outside the structure. Gravity is one such force, acting on all things all the time. 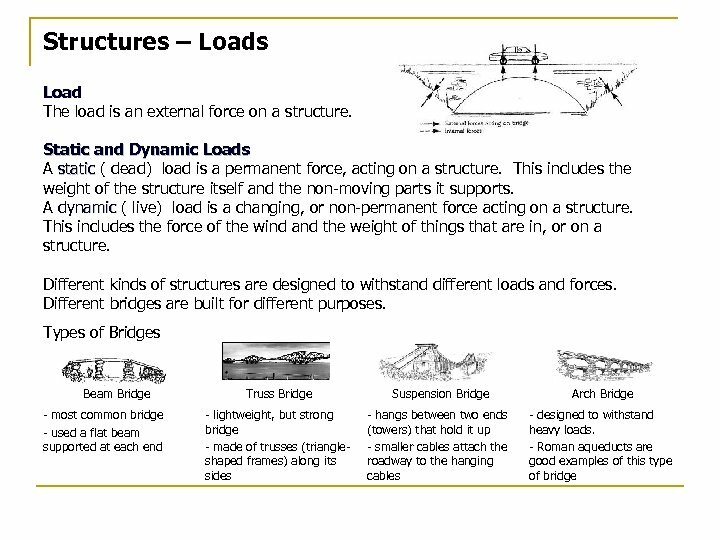 Impact forces (things that collide with the structure) are another type of live load. External forces produce internal forces, or stresses, within the materials from which the structure is made. 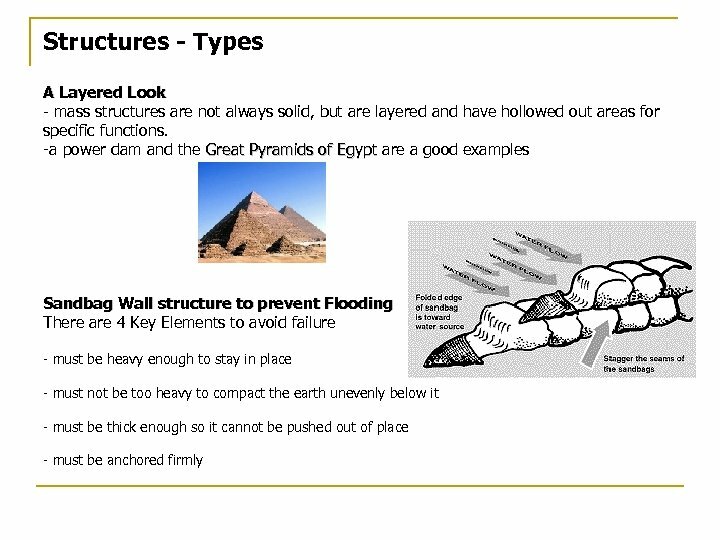 These internal stresses can change the shape or size of a structure and is called deformation. This deformation can lead to repair of the damage to the structure, or failure of the structure. Centre of Gravity The center of gravity is the specific point where all of the mass of the structure is evenly distributed around. The force of gravity acts on all parts of the structure and if all parts are evenly distributed around the center of gravity, then the structure will be stable. 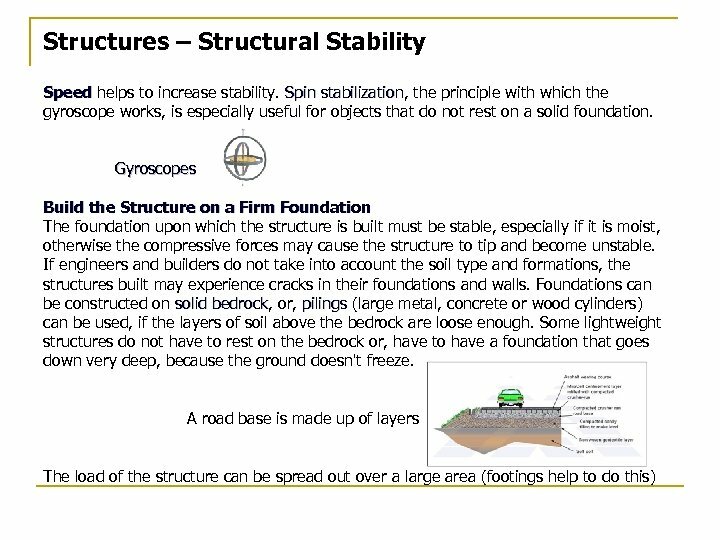 Engineers need to locate the center of gravity of a structure in order to stabilize the structure. 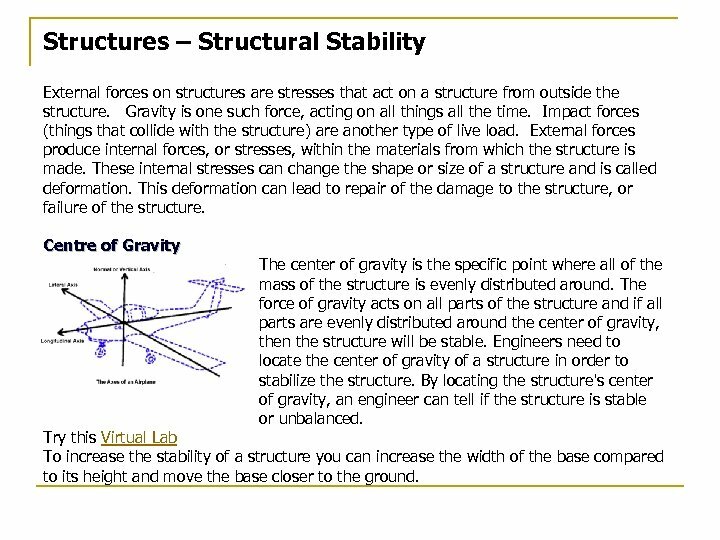 By locating the structure's center of gravity, an engineer can tell if the structure is stable or unbalanced. 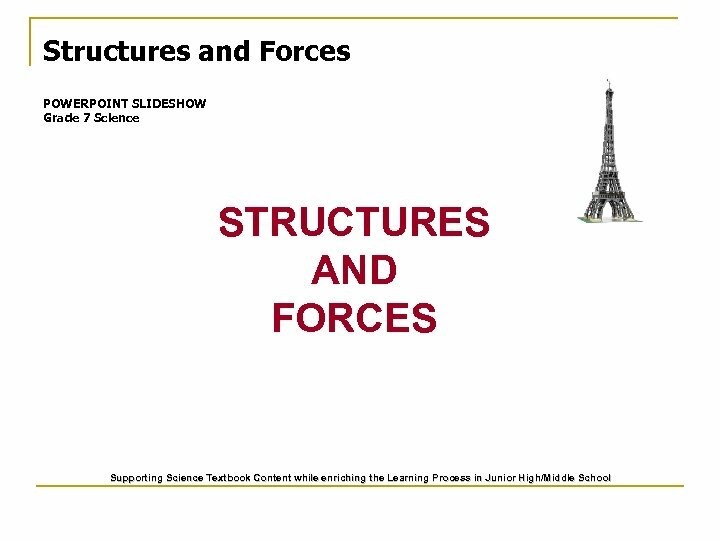 Try this Virtual Lab To increase the stability of a structure you can increase the width of the base compared to its height and move the base closer to the ground. 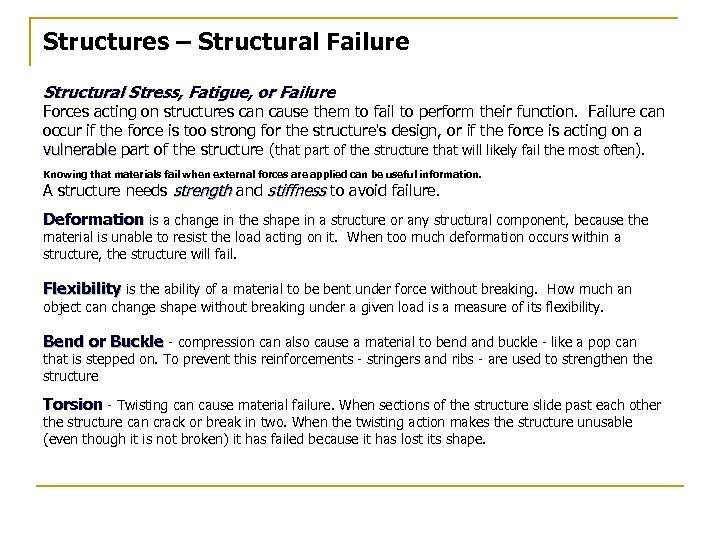 Structures – Structural Failure Structural Stress, Fatigue, or Failure Forces acting on structures can cause them to fail to perform their function. 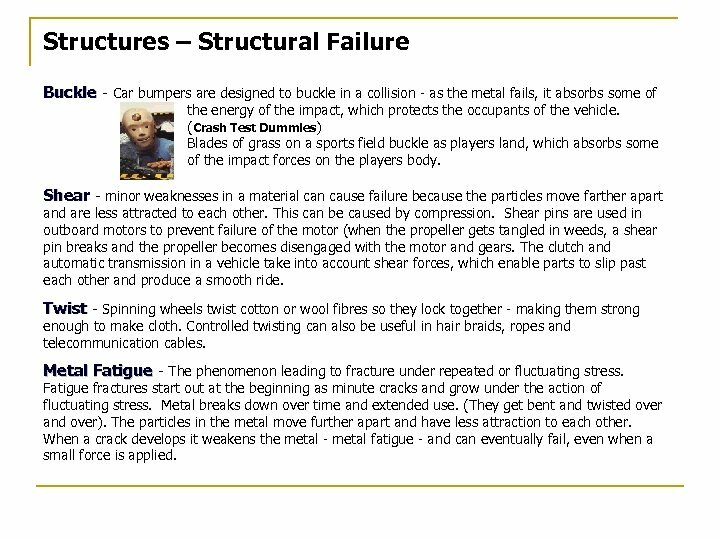 Failure can occur if the force is too strong for the structure's design, or if the force is acting on a vulnerable part of the structure (that part of the structure that will likely fail the most often). Knowing that materials fail when external forces are applied can be useful information. A structure needs strength and stiffness to avoid failure. Deformation is a change in the shape in a structure or any structural component, because the material is unable to resist the load acting on it. When too much deformation occurs within a structure, the structure will fail. Flexibility is the ability of a material to be bent under force without breaking. How much an object can change shape without breaking under a given load is a measure of its flexibility. Bend or Buckle - compression can also cause a material to bend and buckle - like a pop can that is stepped on. To prevent this reinforcements - stringers and ribs - are used to strengthen the structure Torsion - Twisting can cause material failure. When sections of the structure slide past each other the structure can crack or break in two. When the twisting action makes the structure unusable (even though it is not broken) it has failed because it has lost its shape. Structures – Structural Failure Buckle - Car bumpers are designed to buckle in a collision - as the metal fails, it absorbs some of the energy of the impact, which protects the occupants of the vehicle. (Crash Test Dummies) Blades of grass on a sports field buckle as players land, which absorbs some of the impact forces on the players body. Shear - minor weaknesses in a material can cause failure because the particles move farther apart and are less attracted to each other. This can be caused by compression. Shear pins are used in outboard motors to prevent failure of the motor (when the propeller gets tangled in weeds, a shear pin breaks and the propeller becomes disengaged with the motor and gears. The clutch and automatic transmission in a vehicle take into account shear forces, which enable parts to slip past each other and produce a smooth ride. Twist - Spinning wheels twist cotton or wool fibres so they lock together - making them strong enough to make cloth. Controlled twisting can also be useful in hair braids, ropes and telecommunication cables. Metal Fatigue - The phenomenon leading to fracture under repeated or fluctuating stress. Fatigue fractures start out at the beginning as minute cracks and grow under the action of fluctuating stress. Metal breaks down over time and extended use. (They get bent and twisted over and over). The particles in the metal move further apart and have less attraction to each other. When a crack develops it weakens the metal - metal fatigue - and can eventually fail, even when a small force is applied. 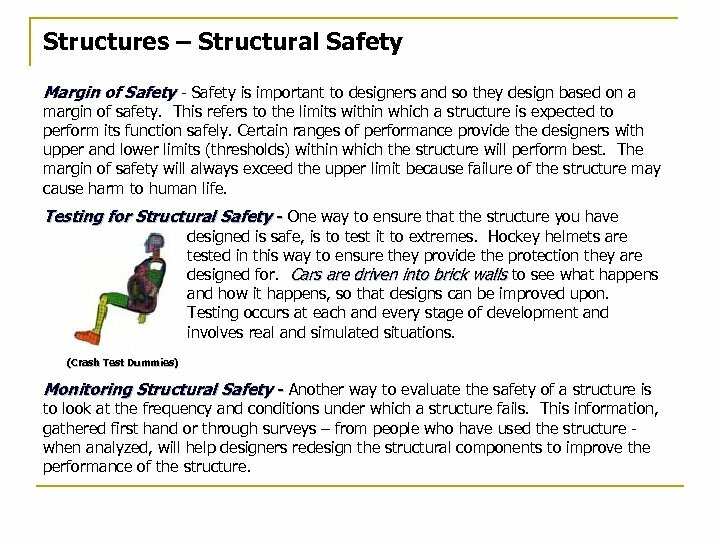 Structures – Structural Safety Margin of Safety - Safety is important to designers and so they design based on a margin of safety. 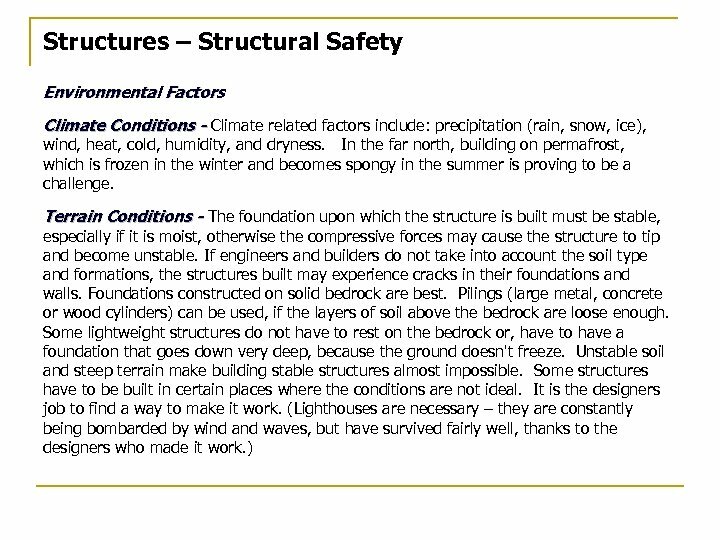 This refers to the limits within which a structure is expected to perform its function safely. Certain ranges of performance provide the designers with upper and lower limits (thresholds) within which the structure will perform best. The margin of safety will always exceed the upper limit because failure of the structure may cause harm to human life. Testing for Structural Safety - One way to ensure that the structure you have designed is safe, is to test it to extremes. Hockey helmets are tested in this way to ensure they provide the protection they are designed for. Cars are driven into brick walls to see what happens and how it happens, so that designs can be improved upon. Testing occurs at each and every stage of development and involves real and simulated situations. (Crash Test Dummies) Monitoring Structural Safety - Another way to evaluate the safety of a structure is to look at the frequency and conditions under which a structure fails. 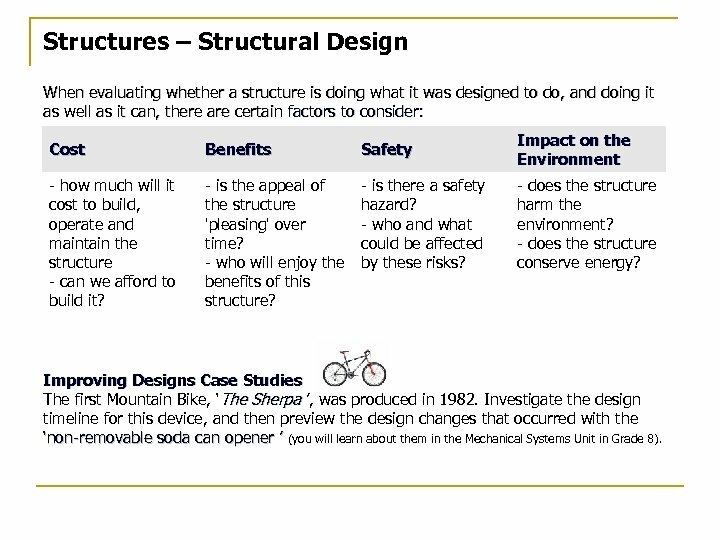 This information, gathered first hand or through surveys – from people who have used the structure when analyzed, will help designers redesign the structural components to improve the performance of the structure. Structures – Structural Safety Earthquake Risk Earthquake proof building are being more closely monitored and improved upon. The forces of an earthquake are unpredictable and so the margin of safety in the design has to be extremely high and that has been a challenge. Can you make an Earthquake Proof Building? Building http: //school. discovery. 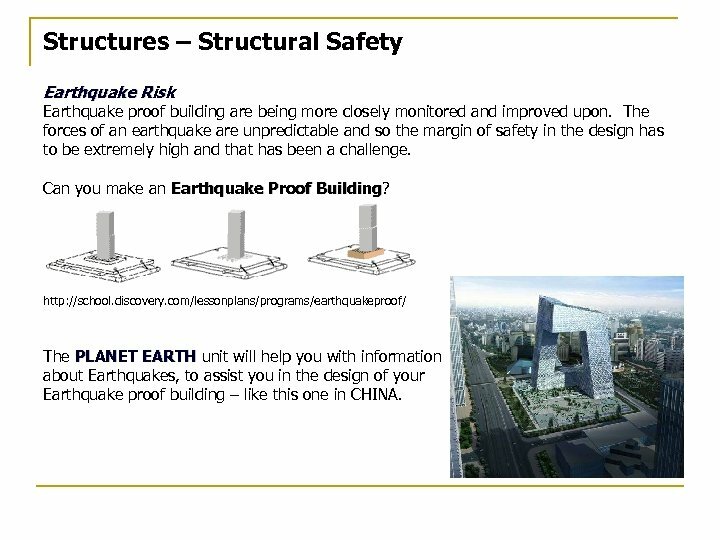 com/lessonplans/programs/earthquakeproof/ The PLANET EARTH unit will help you with information about Earthquakes, to assist you in the design of your Earthquake proof building – like this one in CHINA.